This grid with short distances is an excellent gymnastic to flex and stretch the horse’s top-line. 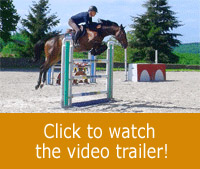 The set-up will encourage the horse to stay alert and pay attention to the rider’s cues. Needless to say that the tight sequence of the jumps stimulates the velocity of the horse’s front legs’ actions, his style and the rounding of his back above the fences. 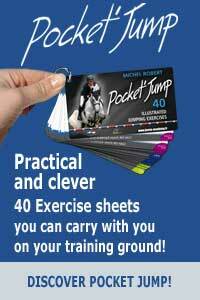 This exercise is best suited for experienced horses and riders. Meaning that they are already familiar with grids of cavalettis, bounces and short distances between fences. You can find some preliminary exercises on Horse Academy to practise in order to get ready for this exercise which is more difficult. (See below the contents related to this subject). The goal is not to jump high. The first fence of the grid should not exceed 50 cm (about 20 inches) and the fence out of the grid should not exceed one meter (Three feet high). The grid should be approached at a trot or a collected canter. Michel rides Tosca. He previously did a warm-up including jumping her over some cavaletttis. The first two or three times you go over the grid, the height should not exceed 80cm. You can raise the height of the fences only if the horse has understood the exercise perfectly and if the rider is able to keep him straight over the line and follow perfectly the movement of his horse over the jump. Once again, the rider’s position is essential to follow the flow of the movement: not preceding or not late compared to the jumping movement. The lateral balance needs to be addressed as well to avoid encouraging the horse to deviate from the fences’ line. Indeed, the cross rails half-way through the grid are useful to keep the horse in line as well as the rider’s eyes focusing beyond the grid rather than on the fences.